This Spring I made a trip back to Ethiopia to the location where we filmed “A Walk to Beautiful” a decade ago. I went with Allison Shigo, who took the experience of co-producing AWTB and turned it into her life’s dedicatIon. She founded Healing Hands of Joy and is fighting to end fistula in Ethiopia for good by training and empowering mothers in the villages that are most effected. 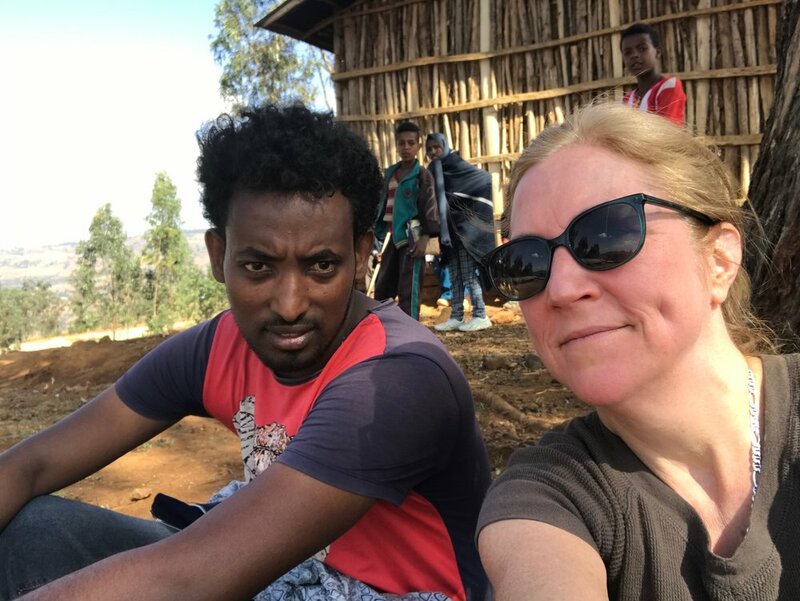 Here with Allison and an HHOJ safe motherhood ambassador, Gojam, in the mountainous Amhara region. Top left I reunited with Yenenesh, the teenager in AWTB who had obstructed labor by the side of the road at age 13. At HHOJ headquarters in Bahir Dar we filmed the graduating class of safe motherhood ambassadors. The highlight of the trip was being trapped in the village by a massive hail storm. We took refuge in the health agent’s house and enjoyed traditional Ethiopian coffee. An exciting journey to Papua, Indonesia for GSK’s Global Health Program to meet patients receiving donated drugs for a debilitating disease called lymphatic filariasis. It took three flights to get there just from Jakarta, the capital. Renowned British photographer Marcus Perkins, seen here on his knees next to a woman living with lymphatic filariasis (LF), took these “snaps.” Producer Brean Cunningham holds the boom next to the traditional house on stilts and we pose for a jungle shot with our location manager Putu from Jungle Run Productions. In Nepal for another journey to meet people living with lymphatic filariasis (LF). Here with Tijana Duric, (photographed with the family) and Minne Iwamoto from GSK’s Global Health Programmes, whose deep respect and compassion motivates our filming. We enjoyed a beer over Kathmandu’s Durbar Square just three weeks before these ancient religious temples crumbled to the ground in an earthquake. Closer to home, but no less thrilling, filming amongst America’s finest artwork— from a portrait by Chuck Close to “Three Flags” by Jasper Johns. I interviewed artists and the directors of NYC’s greatest museum’s to produce a “Tribute to Leonard A. Lauder” (son of Estee and perhaps the most influential patron of American art from this century). Director of Photography Rick Siegel seen with sound recordist and engineer Mike O’Conner waiting for an interview. The crew on the elevator in the studio of pop artist Claus Oldenberg, with production coordinator Amelia Viner. And lastly with artist Kiki Smith. Again with GSK - this time in the “warm heart of Africa” with DP Jerry Risius and producer Brean Cunningham. We traveled around the country to film people living with LF and to experience the beauty and hospitality of one of Africa’s poorest countries. Our “tour guide” is head of the LF program for the ministry of Health, Square Mkwanda. His hard work and leadership alongside volunteer community health agents has lead to the elimination of LF in Malawi. A side trip to enjoy a safari!